The "M.S." (KMS 300) is a 1969 standard,sunroof beetle, that I acquired in 2012. Its restoration has been a labour of love. A total "bolt to bolt" pan-off restoration with every bolt and nut replaced (where possible). This mettalic orange "hot number" has a 1500cc overhauled aircooled engine upgraded with a doghouse oil cooling system, modern slim front seats, custom dash and console and a bunch of many other cuatomized, performance and stock upgrade parts in the car. 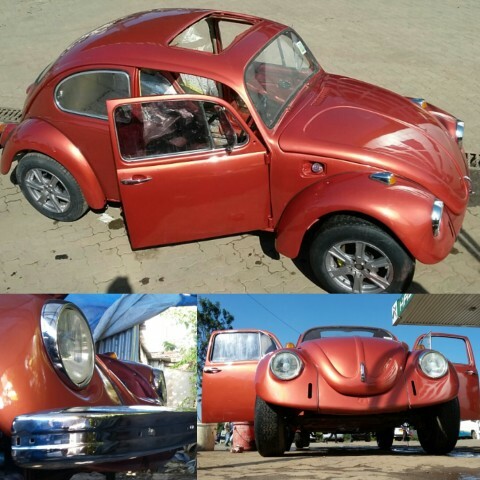 Yet to be named, this bug is a good enough custom and is aptly branded as "Cobzwagen"